He looks as if he’s saying to the human world. What do you think I evolved from a butterfly? 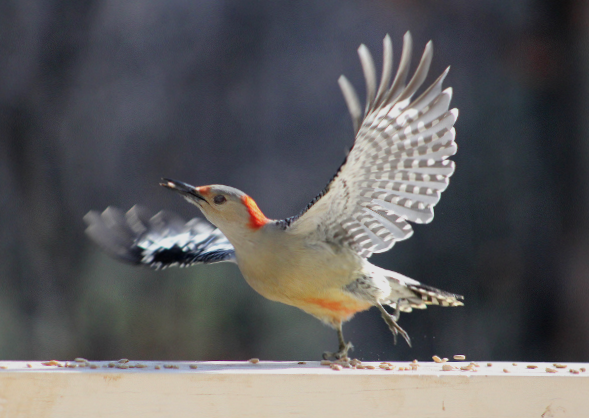 This great photo of a female red-bellied woodpecker is one of the few that clearly show the often-hidden belly feathers that give the species its name. Oh, YAY!! Wonderful photo. I was just out of the shower this morning and looked out into the backyard (after I got dressed) and there was a stunning red-bellied woodpecker on one of the suet feeders. He stayed there for a LONG time – I think the frozen suet may have been a difficult meal requiring patience and finesse. He did look around continuously while dining. He was probably checking to see if the two Cooper’s Hawks that were lurking in the pin oak in the backyard the other day were back. Really like your blog. Thank you so much for your lovely comment, nugget59. I too enjoy watching the birds that come to my deck every day!